ORCID number: Hua Li (0000-0003-2423-7689); Zhi-Bin Huo (0000-0003-3985-1972); Fan-Ting Kong (0000-0003-2098-0002); Qing-Qiang He (0000-0001-7771-1618); Yun-He Gao (0000-0002-2357-0693); Wen-Quan Liang (0000-0002-8667-0958); Deng-Xiang Liu (0000-0003-4047-1379). Author contributions: Li H, Huo ZB and Fan-Ting Kong contributed equally to this work. Liu DX, Li H, designed the research; Li H, Huo ZB and Fan-Ting Kong analyzed the data and drafted the manuscript; He QQ revised the manuscript critically for important intellectual content and contributed to the data analysis; Gao YH and Liang WQ helped draft the manuscript; all authors read and approved the final manuscript. Institutional review board statement: This study is a retrospective study for the data of patients collected from the Department of Surgical Oncology, Affiliated Xing Tai People’s Hospital of Hebei Medical University during 1990-2015. No human body was involved in this study. In our hospital policy, this study does not require approval by the hospital. Informed consent statement: All study participants, or their legal guardian, provided informed written consent prior to study enrollment. Conflict-of-interest statement: No conflict of interest was declared by the authors. To investigate the predictive factors of lymph node metastasis (LNM) in poorly differentiated early gastric cancer (EGC); to guide the individual application of a combination of endoscopic submucosal dissection (ESD) and laparoscopic lymph node dissection (LLND) in a suitable subgroup of patients with poorly differentiated EGC. We retrospectively analyzed 138 patients with poorly differentiated EGC who underwent gastrectomy with lymphadenectomy between January 1990 and December 2015. The association between the clinicopathological factors and the presence of LNM was retrospectively analyzed by univariate and multivariate logistic regression analyses. Odds ratios (OR) with 95% confidence interval (95%CI) were calculated. We further examined the relationship between the positive number of the significant predictive factors and the LNM rate. The tumor diameter (OR = 13.438, 95%CI: 1.773-25.673, P = 0.029), lymphatic vessel involvement (LVI) (OR = 38.521, 95%CI: 1.975-68.212, P = 0.015) and depth of invasion (OR = 14.981, 95%CI: 1.617-52.844, P = 0.024) were found to be independent risk factors for LNM by multivariate analysis. For the 138 patients diagnosed with poorly differentiated EGC, 21 (15.2%) had LNM. For patients with one, two and three of the risk factors, the LNM rates were 7.7%, 47.6% and 64.3%, respectively. LNM was not found in 77 patients that did not have one or more of the three risk factors. ESD might be sufficient treatment for intramucosal poorly differentiated EGC if the tumor is less than or equal to 2 cm in size and when LVI is absent upon postoperative histological examination. ESD with LLND may lead to the elimination of unnecessary gastrectomy in poorly differentiated EGC. Core tip: The new technique combines endoscopic submucosal dissection (ESD) with laparoscopic lymph node dissection (LLND), which may lead to the elimination of “unnecessary” gastrectomy in poorly differentiated early gastric cancer (EGC) patients that have a potential risk of lymph node metastasis (LNM). ESD followed by LLND enables the complete resection of the primary tumor and the histologic determination of the lymph node status. In this study, we determined the risk factors that were predictive of LNM in poorly differentiated EGC patients. Our results provided some suggestions to guide the application of combination of ESD and LLND for selected patients with poorly differentiated EGC. Endoscopic submucosal dissection (ESD) has become widely accepted, as it provides en bloc resection and histologically complete resection and is a valuable alternative to gastrectomy for treating early gastric cancer (EGC)[1-4]. The accurate assessment of the potential presence of lymph node metastasis (LNM) is required for ESD. ESD can be used for EGC but it does not have the risk of LNM[5-7]. Because the risk of LNM is negligible (0%), ESD is often applied to well or moderately differentiated EGC confined to the mucosa without ulceration and smaller than or equal to 2 cm. For undifferentiated EGC, the risk of LNM is higher so the usage of ESD has been limited. Thus, for patients with undifferentiated EGC, gastrectomy was accepted as a standard treatment. Undifferentiated carcinomas of gastric cancer consist of mucinous adenocarcinoma, primary signet ring cell carcinoma and poorly differentiated adenocarcinoma. However, approximately 96.6% of poorly differentiated EGC cases with potential risk of LNM are eventually found to have no LNM after “unnecessary” gastrectomy, suggesting that it may be overtreatment for these cases. The new technique combines ESD with laparoscopic lymph node dissection (LLND), which may lead to the elimination of “unnecessary” gastrectomy in EGC patients having a potential risk of LNM[10-13]. ESD followed by LLND enables the complete resection of the primary tumor and the histologic determination of the lymph node status. In this retrospective study, we determined the risk factors that were predictive of LNM in poorly differentiated EGC patients. Our results provided some suggestions to guide the application of combination of ESD and LLND for selected patients with poorly differentiated EGC. EGC is considered to be a lesion confined to the mucosa or submucosa regardless of the presence or absence of LNM, according to the Japanese Classification of Gastric Carcinoma (JCGC). This retrospective study enrolled patients who had undergone radical gastrectomy due to EGC. The patients were from the Department of Surgical Oncology, Affiliated Xing Tai People’s Hospital of Hebei Medical University (Xingtai, China). Time points were from January 1990 to December 2015. For this current study, inclusion criteria included: (1) Diagnosed with poorly differentiated EGC depending on JCGC by pathological analyses through specimens and lymph nodes; (2) Lymph node dissection beyond limited (D1) dissection; (3) Over sixteen lymph nodes dissected; and (4) Available medical record from database. During the 25 years, a total of 138 patients (87 men and 51 women) with histopathologically poorly differentiated EGC were included for analyses. The ages of the patients ranged from 29 to 81 years (mean 49). For each patient, lymph nodes were dissected from the en bloc specimens. The classification was performed according to the JCGC. After careful review of specimens, an experienced surgeon gave the classification of the dissected lymph nodes. After that, the lymph nodes were sectioned and the histopathologic and immunohistochemical features were detected by eosin and hematoxylin staining and immunohistochemistry. Pathological examination for metastasis and lymphatic vessel involvement (LVI) was detected by immunohistochemistry with D2-40. We used uniform measurement standards to guarantee uniformity of treatment among the sample over the 25 years. Histologic slides were re-read in a blind manner by one pathologist. The main clinical and pathological data could be obtained from archival documents, including surgical report, conclusions of the pathologist, and the patient card. In this current study, we included clinicopathological parameters according to JCGC for analysis. These parameters included family medical history of gastric cancer, gender (female, male), age (≥ 60 years, < 60 years), lymphatic vessel involvement, depth of invasion (mucosa, submucosa), macroscopic type, ulceration, tumor size (maximum dimension ≤ 2 cm, or > 2 cm), location of tumor (lower, middle, or upper stomach), number of tumors (single or multiple). As described below, the relationship between LNM and clinicopathological factors was explored. Chi-squared test was performed to determine differences between patients with and without LNM in clinicopathological parameters. After that, multivariate stepwise logistic regression analysis was carried out to identify independent risk factors for LNM. Hazard ratio and 95% confidence interval (CI) were calculated. A P value < 0.05 was considered to have statistical significance. All statistical analyses were performed using SPSS v21.0 software (IBM Corp, Armonk, NY, United States). Table 1 showed the relationship of LNM and clinicopathological factors using a χ2 test. Results showed that tumor diameter > 2 cm, the presence of LVI, and submucosal invasion were associated with a high LNM rate (P < 0.05). On the other hand, no significant association was observed between LNM and family medical history, macroscopic type, ulceration, location, number, age or gender. Table 1 Univariate analysis of potential risk characteristics for lymph node metastasis n (%). Univariate analysis results demonstrated that there are three significantly associated characteristics with LNM. Multivariate analysis showed that for LNM, all three characteristics were independent and significant risk factors (P < 0.05, Table 2). Table 2 Multivariate analysis of potential risk factors for lymph node metastasis. Twenty-one (15.2%) of 138 patients diagnosed with poorly differentiated EGC had LNM. The relationship between the three risk clinicopathological factors (tumor diameter > 2 cm, LVI, and submucosal invasion) and LNM was studied in poorly differentiated EGC. In poorly differentiated EGC, for patients with one, two or three risk factors, LNM rates were 7.7% (2/26), 47.6% (10/21) and 64.3% (9/14), respectively. For the other 77 patients without any of the risk factors, we did not find any LNM (Table 3). Table 3 Association between the three identified risk factors and lymph node metastasis in poorly differentiated early gastric cancer. Endoscopic treatments, such as EMR and ESD, are standard treatments for EGC. ESD is superior in allowing en bloc resection at the submucosal location, leading to accurate pathologic assessment of specimens[14-16]. The dominance of ESD over surgery is less invasive, less expensive, and it better preserves physiological function[17,18]. ESD is applied to EGC without LNM, and the indication criteria for differentiated cancer. On the other hand, even though the gastric lesions can be completely removed with ESD for patients with poorly differentiated EGC, standard gastrectomy with lymph node dissection is usually performed. However, gastrectomy may be not necessary for poorly differentiated EGC patients, of which approximately 96.6% patients with surgically treatment actually do not have LNM. Complications from gastrectomy are rare and not serious, including postoperative reflux esophagitis, dumping syndrome and impaired food intake[19,20]. If gastric lesions can be completely removed and lymph node status can be histologically determined before gastrectomy, unnecessary surgery could be obviated. The new technique combines ESD with LLND, and not only completely resects the primary tumor but also determines the histologic status of the lymph node. A precise prediction of the presence of LNM plays a vital role in choosing ESD for EGC. The factors that can help to predict LNM have been verified by previous studies in EGC. However, few studies have tried to explore whether ESD can be used in poorly differentiated EGC. Thus, we would like to seek a possible way to expand ESD in poorly differentiated EGC. In this study, we retrospectively examined the poorly differentiated EGC cases to confirm whether LNM could be predicted. Our data indicated that LNM has significant predictive factors, including tumor diameter > 2 cm, presence of LVI, and submucosal invasion. This present study demonstrates that poorly differentiated EGC are in accordance with some published studies, indicating the existence of a significant correlation between the presence of LVI, submucosal invasion and large tumor size with high LNM incidence[21-29]. During the analysis of this study, numerous relevant subgroup analyses were also done to identify patients of whom the potential LNM can be excluded and then find the candidates who are potentially curable by ESD treatment. Interestingly, we found that patients whose tumor is confined to the intramucosa, and is less than or equal to 2 cm without LVI did not have LNM, indicating that for these cases, ESD could be sufficient and over-treatment may be avoided. In addition, the association between the positive number of the three risk factors (presence of LVI, tumor diameter > 2 cm, and submucosal invasion) and LNM rate were further studied to discuss management strategies for the treatment of poorly differentiated EGC. From the results of this study, we have determined that there is a certain association between LNM rate and number of significant risk factors. When the number of factors is one, two or three, LNM rates were 7.7%, 47.6% and 64.3%, respectively. Therefore, gastrectomy with lymphadenectomy is preferable for these patients with risk factors. Standard gastrectomy with lymphadenectomy remains of value as standard therapy for the potential presence of LNM in poorly differentiated EGC patients. However, the combination of ESD and LLND could avoid unnecessary gastrectomy. Studies have been reported that some patients with EGC received ESD, but the surgery could not meet standard or expanded resection. Salvage treatment of LLND showed overall survival benefits[30,31]. ESD has a high complete resection rate for localized primary tumor, and LLND has complementary surgical benefits, which could enable the confirmation of negative LNM. Thus, this combination was a survival effective strategy compared to conventional treatment. Indeed, previous data have shown that this combination has a significantly greater effect on overall survival during the long-term follow-up period. The combination of ESD and LLND has fewer complications (such as perforation, etc.) and can be used in any areas in the stomach. Therefore, the combination of ESD and LLND may be an effective, minimally invasive treatment and beneficial for long-term quality of life in poorly differentiated EGC patients. However, this study has several limitations. It was a single center study, and the sample size was relatively small. Moreover, our study was performed retrospectively, and the data collected were not randomized and could have been subject to associated bias. Therefore, our findings and conclusions may be not very informative to make robust conclusions. Randomized, prospective studies are needed to verify these results. In this study, we proposed a novel treatment strategy for patients with poorly differentiated EGC (Figure 1). For patients with a tumor less than or equal to 2 cm in size or when LVI is absent upon postoperative histological examination, ESD might be sufficient treatment. The combination of ESD and LLND enables complete resection for not only the primary tumor but also the potentially metastatic lymph node. When LLND reveals LNM or specimens of ESD shows with LVI, gastrectomy with lymphadenectomy may be a better choice to achieve R0 resection. We believe that LLND may lead to the elimination of ESD in poorly differentiated EGC patients having a potential risk of LNM. Figure 1 Flow chart of the therapeutic strategy for cases with poorly differentiated early gastric cancer. EGC: Early gastric cancer; ESD: Endoscopic submucosal dissection; LLND: Laparoscopic lymph node dissection; LVI: Lymphatic vessel involvement. 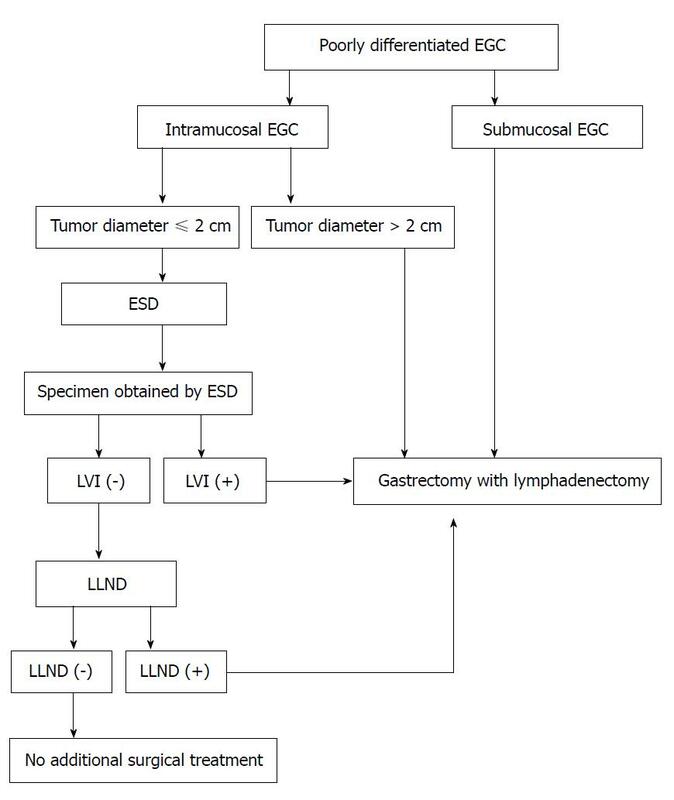 For patients with poorly differentiated early gastric cancer (EGC), gastrectomy with lymphadenectomy is usually performed even though the gastric lesions can be completely removed with endoscopic submucosal dissection (ESD) due to the higher risk of lymph node metastasis (LNM). However, many surgical EGC cases actually do not have LNM, indicating that this surgery may not be necessary for many cases of EGC. To avoid this unnecessary surgery, the new technique combines ESD with laparoscopic lymph node dissection (LLND), which may lead to the elimination of unnecessary gastrectomy in poorly differentiated EGC patients having a potential risk of LNM. We attempted to identify a subgroup of poorly differentiated EGC patients in whom the risk of LNM can be ruled out and treated them with ESD and LLND, which may serve as a breakthrough treatment for poorly differentiated EGC. In this study, we intended to determine the risk factors that were predictive of LNM in poorly differentiated EGC patients and to provide some suggestions to guide the application of the combination of ESD and LLND for selected patients with poorly differentiated EGC. We retrospectively analyzed 138 patients with poorly differentiated EGC who underwent gastrectomy with lymphadenectomy (between January 1990 and December 2015). We also retrospectively analyzed (by univariate and multivariate logistic regression analyses) the association between the clinicopathological factors and the presence of LNM. We further examined the relationship between the positive number of the significant predictive factors and the LNM rate. Tumor size, depth of invasion and lymphatic vessel involvement were found to be independently risk clinicopathological factors for LNM in poorly differentiated EGC. Furthermore, we established a simple criterion to expand the possibility of using ESD and LLND for the treatment of poorly differentiated EGC. ESD might be sufficient treatment for intramucosal poorly differentiated EGC if the tumor is less than or equal to 2 cm in size, and when lymphatic vessel involvement is absent upon postoperative histological examination. We found that the ESD with LLND may lead to the elimination of unnecessary gastrectomy in poorly differentiated EGC. The minimization of therapeutic invasiveness in order to preserve quality of life is a major topic in the management of EGC. One of the critical factors in choosing minimally invasive surgery for EGC would be the precise prediction of whether the patient has LNM. Therefore, in the future, we will carry out this retrospective study to determine the clinicopathological factors that are predictive of LNM in EGC and to guide the individual application of minimally invasive surgery in a suitable subgroup of patients with EGC.